Well beyond the capabilities of simple drug to drug interaction databases, the technology considers a patient’s entire medical history including medication list in combination with medical diagnosis list and biomedical readings to recommend discontinuing medications and/or reducing dosage which may be causing harm, or may no longer be providing benefit to the patient. The software also identifies important potential prescribing omissions for the patient based on their current medical diagnosis. Each patient medical record is reviewed instantly and automatically. Any changes made in the patient medical record, including added clinical information, are picked up by the software and the review is re-run to incorporate these changes. Real-time alert recommendations are made at point of consultation and are not confined to point of prescribing. Importantly, this alerts the clinician immediately to a current medication treatment which is potentially inappropriate or a potential prescribing omission. This may also be a contributing factor to patient’s current health complaint. With our analytics platform, reports are generated at both patient level and population level. All patient medication reviews completed by the software are accessible through the analytics platform and are updated daily. This means that clinicians and health care providers can generate reports which are always up-to-date. Clinicians have immediate access to each patient’s most recent medication review completed by the software. Identify patients triggering the highest number of alerts. Target patients at highest risk of ADEs, and identify changes needed in their drug therapy. 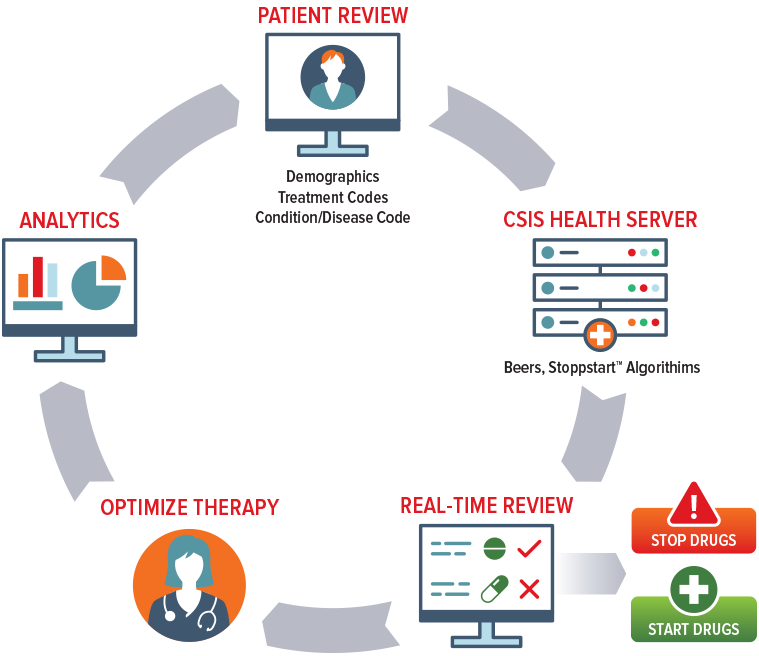 The technology is designed to integrate seamlessly with all clinical systems such as EMR and EHR across the organization and care continuum – ambulatory, acute and post-acute.